Dubai-based Dalia Dogmoch Soubra — restaurateur, Harper’s Bazaar Arabia food editor, and cookbook author — is introducing her eclectic cuisine and entertaining to the States with her book Food, Love and Life from Dalia's Kitchen (already out in the Middle East). You can get a sense of the trajectory of the Syrian-German food personality (it looks like this: Syria-Germany-Paris-New York-Beirut-Dubai) through her recipes, a veritable East-West melting pot of cultures, histories, and flavors that span the ages. Below, a recipe for a sweet French-Middle-Eastern mash-up of the crowd-pleasing variety. 1. Heat a heavy-bottomed saucepan over medium heat with the cream, milk, sugar, vanilla bean seeds and pod. Bring to a boil and remove pod. 2. In a bowl, whisk yolks until they turn pale yellow, then add a little of the hot cream mixture. Mix vigorously. 3. Add more hot cream, a little at a time. Once everything is fully mixed, return to the saucepan and simmer for two to three minutes, whisking continuously until the custard thickens a little. Strain the custard through a sieve. 4. Chill custard for at least three hours, then proceed to add to your ice cream machine (follow the manufacturer's instructions). 5. Once ice cream has formed, fold in halawe. Freeze for one hour. 5. 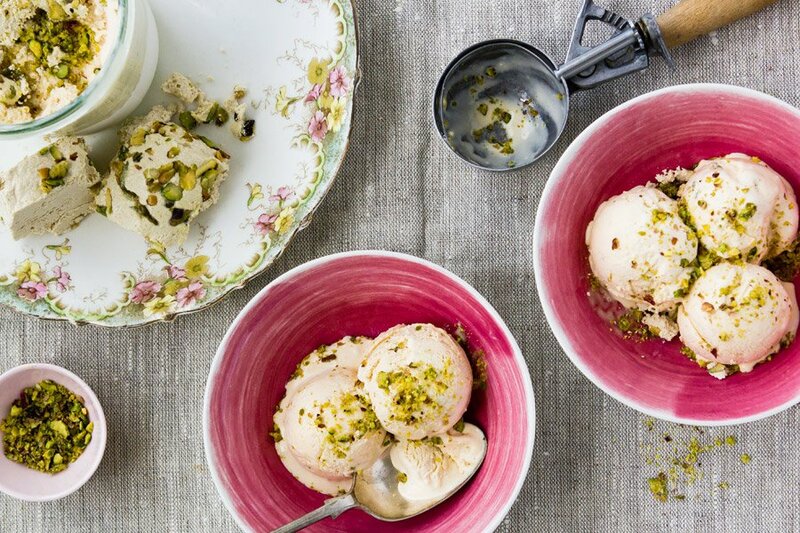 Serve with crushed pistachios sprinkled on top. 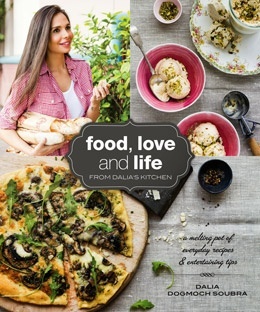 Buy a copy of the book Food, Love and Life from Dalia's Kitchen. Keep up with Dalia at daliaskitchen.com. This recipe was printed with permission from Dalia Dogmoch Soubra.